How does one dress joyously? Does it involved purging your closet? Putting together an amazing ‘let’s get dressed’ playlist? Today, Sally’s telling us how. Dressing can be a chore. If you’re grappling with body image woes, work in a critical or intolerant environment, or are dealing with chronic pain, peering into your closet each morning may prompt more anxiety than elation. But I firmly believe that striving to dress joyously is a worthwhile endeavor. Because we’ve all got to wear clothes every day, and the clothes we choose broadcast information about us to the observing world. And because the clothes we choose can be protective or celebratory or expressive or soothing, and what we wear can change the path we take for the day. Frequently, the biggest, strongest roadblock to joyous dressing is negative feedback from outside sources. It can seem impossible to wear anything but your most unremarkable clothing if you know that anything more daring will be met with unwelcome commentary. But there are ways to both build your courage and deflect nasty remarks. Start by amassing pieces and tools that contribute to your look, then deploy them in small enough amounts that it feels like your little secret. Then try cultivating allies: Talk to a select few people about why dressing this way is important to you, so that you have some supporters amongst the dissenters. And then give my tried-and-true favorite comeback a whirl: Laugh. When someone makes a rude remark about your outfit, just laugh and say, “Hahaha, I know! Isn’t this WILD?” Own it. Never apologize. Then walk away. None of these techniques is foolproof, and your unique situation may make them all seem utterly ludicrous. But the point is this: There are ways. You don’t have to surrender a potential source of joy to buzzwreckers or bullies. Formulate a strategy, take a deep breath, and go forth dressed fabulously. The second biggest, strongest roadblock is self-critique. Whether you believe that your body isn’t “good enough” to pull off a certain skirt, or are convinced that you’re not stylish enough to wear a trendy dress, your own fears and apprehensions constitute a very real impediment to dressing with joy. So try faking it. Gorgeous clothing that has been beautifully designed and expertly manufactured is thrilling to wear. But the most threadbare tee or scuffed-up shoes can prompt more joy than gorgeous designer duds if those well-worn items have sentimental value. Whenever I wear a dress that my mom made for me, or a bracelet that my dad bought for me, or shoes that my husband gave me for Hanukkah, I feel exponentially happier. Every time I glimpse what I’m wearing, I feel loved and cherished. There is no quicker path to joyous dressing than embracing garments that hold emotional meaning. Matte black is eternally chic, but bright red, vibrant yellow, rich purple, and electric blue invigorate both wearer and observer. Sequins and studs add interest and excitement to a garment. Lush layers, draped cloth, richly textured fibers make bodies feel sensually fulfilled. Neutrals are cool and classic, but when you’re aiming for joy, go for color, texture, and shine. In my opinion, figure flattery is so much broader than most style experts would lead you to believe. Flattering clothing lies flat against your body. Flattering clothing doesn’t pull, pinch, or subdivide. Flattering clothing works with your eyes, hair, and skin tone. Flattering clothing creates a silhouette that pleases your eye. And all of these things have value because when your body is flattered as you wish it to be, you feel like your best self. Is it always going to be this simple? No. Will following these exact steps lead to a guaranteed lifetime of joyous dressing? Probably not. Will there be days when dressing joyously falls to the bottom of your priorities? For sure. But again, those of us who move about in non-nudist circles must get dressed every single day of our lives. Many daily tasks are extremely difficult to transform into celebratory affairs: I brush my teeth willingly but without emotion, I do the dishes religiously but grudgingly, and there’s not much I can do to infuse these tasks with my own brand of joie de vivre. But dressing? Dressing CAN be joyous. And I choose to make it so. As can you. What do you wear when you want to feel joyful? I have just started thinking about this after a long illness and a weight gain caused by medication. To be perfectly honest I had no idea to how to begin because this body doesn't seem to be mine and the clothes that fit the real me don't fit me anymore! 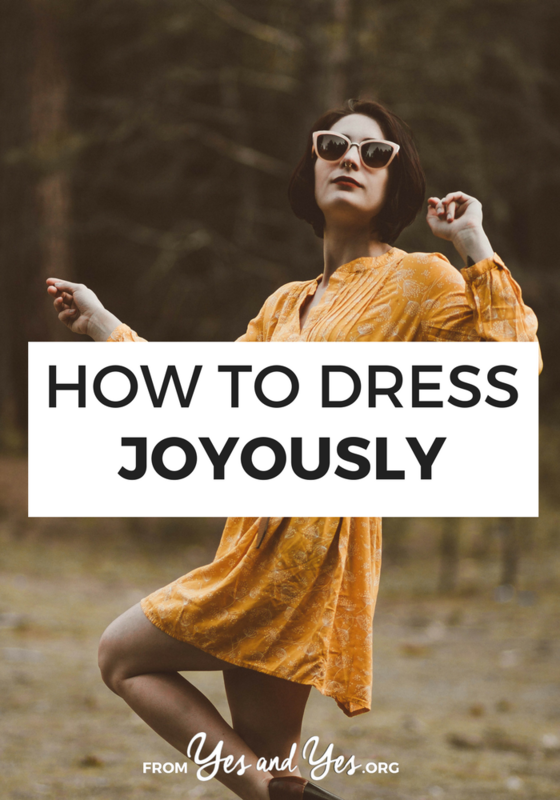 The idea of dressing for joy is fantastic! Thank you I will use these tips! I sometimes become so overwhelmed by clothing and the negative things I say to myself when looking in the mirror that it becomes important to realize that clothes should make me feel good…and they're just clothes! No big deal! Love this! I struggle with my wardrobe a lot. I have a lot of really wonderful business clothes but my job is in a really dirty and casual setting. It's hard to wear them sometimes and I own very little else. Today getting dressed was much easier when I thought about this. Such a great post! I've started doing most of my shopping by myself, and only buying items that I wholeheartedly love. I've ended up with a lot of daring pieces, and I'm loving how I feel in them, even when I'm not getting any positive feedback. It feels so great to love the way I look without relying on outside compliments. agg! I don't even know how to dress myself. Buying clothes is a nightmare because I don't know what the items are even supposed to be (is this a skirt or a top? I don't know!) and then I have to stand in front of a queue of people just to find a mirror, which is not cool. Not Cool! Seriously, my whole childhood, whatever I got to wear was whatever showed up in the trash bags so I got pretty comfortable not having to make any decisions. Now I'm clueless. I dress like a scrub most days. Very interesting commentary. As a guy I have it easier in some ways – plus my work is crawling around under buildings so the work-clothes issue is moot. But I can tell you from a guys perspective that a confident well-dressed woman stands out like they have a spotlight on them. I saw one just yesterday at the grocery store. She didn't have a models figure but was dressed in a vibrant color and obviously paid attention to how she looked, so completely different from the hordes of frumpy women who have given up on themselves. I think the "Dress what makes you happy (within legal limits of course), not just what takes the least energy in the morning," advice is something more women should embrace. For some reason I've had this idea to start wearing a fake mustache when I'm getting dressed, just so that when I look critically in the mirror, my eyes are drawn to my face. and to dress joyously means finding joy; i get joy out of silliness. Thanks for the encouragement, for the tips, and most of all for UNDERSTANDING! This is such great advice! I love Sally's emphasis on creating a silhouette that YOU think is flattering, whether other people agree or not. I love, love, love this post! This pretty accurately sums up the attitude I have towards getting dressed in the morning. Sometimes my joy does waver though, and it's nice to have somebody to help you rediscover it. Thanks so much for this!